BANGI 18 Mei 2012 – School-leavers and graduating students from the universities needed to be proficient in English if they wanted to land suitable jobs in the private sector. This is the view of a number of company officials taking part in the UKM Career Expo 2012 being held at the Chancellor Tun Abdul Razak Hall (Dectar) in the campus here in conjunction with the 42nd anniversary of UKM’s establishment today. A total the 42 companies taking part including Telekom Malaysia, Maybank, CIMB, UDA Holdings, Tabung Haji and Berita Harian. Talks and seminars were also being held on cv writing and how youths can prepare themselves when facing job interviews and the qualities employers are looking for when recruiting for new staff. The expo is jointly organised by Students of the Ibu Zain College and the Industry Liaison Office of the Industry and Community Partnerships Department of UKM. 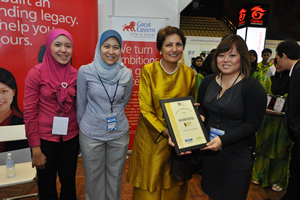 It was launched by the Deputy Vice-Chancellor for Industry and Community Partnerships, Prof Dato’ Dr Saran Kaur Gill who said that networking between institutions of higher and the industry was important for their mutual benefits. Such networking not only allow students to know the industry need but would give good exposure for UKM’s research outputs and products. She said more than 90% of UKM graduates had been successfully absorbed by the job-market or are self-employed. Deputy Vice-Chancellor for Student and Alumni Affairs, Prof Ir Dr Othman A. Karim and Ibu Zain College Master, Anuar Ahmad attended the launching ceremony. Organising chairman of the Expo, Jonathan Liew, a final-year Biochemistry undergraduate said school-leavers and graduates needed to be fluent in English and also able write their resumes and face interviews in English to make a good impression. He said the lack of fluency in English was a major hindrance not only to youths but even those with high qualifications when looking for a lucrative job. One of the companies taking part in the expo UDA Holdings is looking Engineering, Architecture and Accountancy graduates for employment. The Assistant General-Manager of UDA Holdings, Nik Norzlan Thani said the property management company needs candidates with soft skills, that is being fluent in English and have finesse, to be groomed for company leadership. Another executive a leading bank who do not want to be identified said it’s not just English that is important but the staff needed to be articulate and can get along with clients. 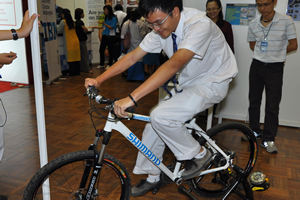 The expo is open to all UKM students and students from nearby schools who were invited to attend. More than 100 students from Sekolah Menengah Kebangsaan Sri Serdang benefited from the exhibition today attending a seminar given by motivational specialists in various fields on the complexities of looking for a suitable job.